Friday 2nd December 2011 saw the UK launch of the new EUscreen portal. This event took place at the British Universities Film & Video Council (BUFVC) Annual General Meeting at the Royal Geological Society in Piccadilly, London. Eve Oesterlen from BUFVC and Dr Sian Barber from Royal Holloway University of London presented the EUscreen project to an audience of 70 guests. 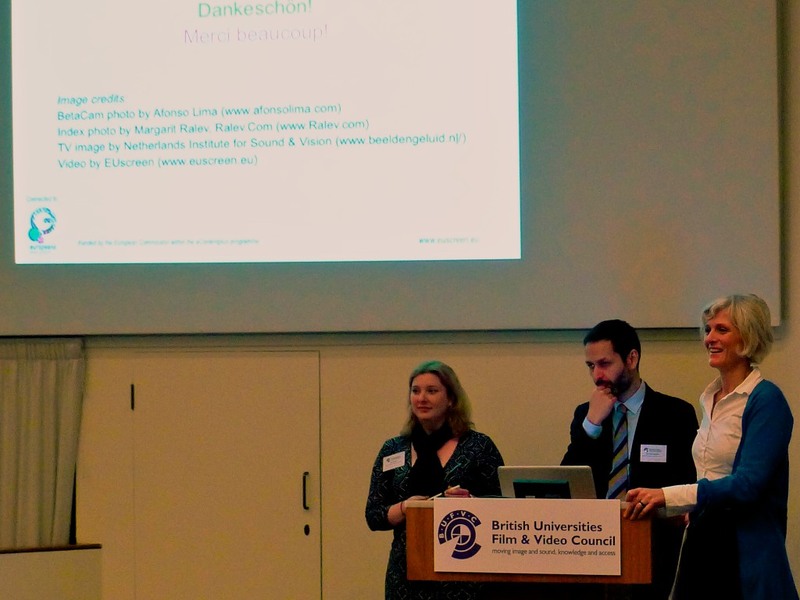 The focus of the event was ‘more access’ and a variety of presentations on different projects demonstrated how this issue informs and influences BUFVC activity and how the EUscreen project fits into this agenda. Sian Barber outlined the aims of the EUscreen project and highlighted the innovative nature of the content selection policy, explaining how functionalities like the virtual exhibitions and the content provider special collections will offer different user experiences from the rest of the portal. The technical side of the project was also used to demonstrate the complexities of EUscreen with Eve Oesterlen offering a brief overview of the challenges of the metadata scheme and working with different partners, different languages and individual workflows. Sian then suggested how EUscreen content could be used and drew attention to this material as a useful resource for students, scholars, teachers and casual browsers. The presentation and portal launch focused on the objectives of the project, what has been achieved so far and how EUscreen content offers exciting research and teaching and learning possibilities. The presentation concluded with a showing of the EUscreen promotional video and a suggestion that the audience explore the EUscreen portal for themselves. Following the presentations, a number of people queried what would happen to the EUscreen site and its material once the project was completed. It was felt that such careful work and such rich content should remain available as a resource. Launching the EUscreen portal at this event offered the site to a new audience of those who work with audiovisual resources within education. The enthusiastic response of many people to the EUscreen portal, its content selection policy and detailed metadata schema demonstrates that there is a great deal of interest in the project and that the material is viewed as a useful resource for both teaching and learning. Other highlights of the day included a presentation by Hetty Malcolm-Smith on the BUFVC Shared Services project. This ambitious project is based on a feasibility study and aims to link up the BUFVC collections of TRILT and TVTip with BoB National and data feeds from broadcasters, Channel 4 press packs and Higher and Further Education Institutions. The project also aims to include access to VHS recordings to help create the richest source of data for education in the UK and will begin by evaluating the possibilities of such a service. One of the key resources for the shared service project will be the Channel 4 Press packs which are currently being fully digitised as part of the 1980s project at the University of Portsmouth. Dr Justin Smith (Portsmouth) and Linda Kaye (BUFVC) introduced this four year project which began in April 2010 which will have academic outputs but will also offer a context to the digitisation process. Each page of the press packs will be created as a PDF file to ensure that it can be individually identified and to improve access for the end user. Digitising the material in this way also offers access to the related and contextual data which surrounds the core information. The final presentation of the day focused on other projects which involve the BUFVC, notably the Chronicle project; a collaboration with JISC and the BBC which will provide restricted access to news material from BBC Northern Ireland from the 1960s and 1970s.